These Youth Soccer Practice Plans feature structured, step-by-step plans for 20 practices with diagrams explaining activities accompanied by key coaching points. Available as an instant digital download, this ebook enables you to print out each plan and bring it to practice, or follow along on your smart phone. You’ll save time by being ready for practices in minutes. Follow a proven system that works. You’ll look great as a coach, and as a result, your players will be the primary beneficiaries. Success belongs to the well prepared! 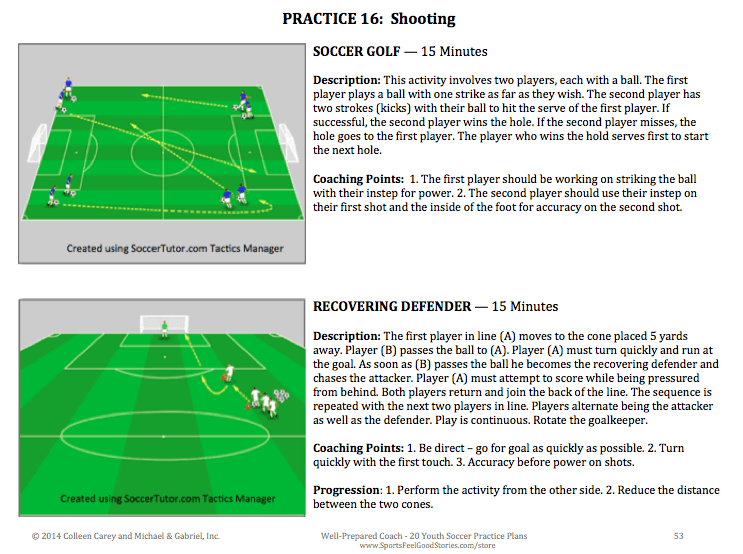 Over 90 diagrams to explain the soccer drills and activities. Author Colleen Carey was 2 times selected as MIAC Conference Coach of the Year for the University of St. Thomas. A complete season’s worth of plans. Easy to understand explanations, and well thought out, age appropriate agendas. Designed for coaches of U8 teams thru U12 teams – both boys and girls. Practices are 90 minutes for U12 teams and reduced times are suggested for younger teams. The focus is on player development and teaching soccer fundamentals. Kids learn best when they’re having some fun, and the activities were selected with kids in mind. As a player, coach and director of coaching in soccer, Colleen Carey has earned high levels of achievement. Currently, Carey is Director of Coaching for the Eagan Wave Soccer Club where she is responsible for player and coach development for some 650 players and 45 coaches. She holds an USSF National “B” coaching license and a US Youth Soccer National Youth license. Carey coached with the Minnesota State Olympic Development Program for the past 8 years. She is also a member of the Player Development Committee within the Minnesota Youth Soccer Association. As a high school soccer star, she led the Anoka Tornadoes to victory in the 1990 Minnesota High School Prep Soccer Championship. She played college soccer and basketball at the College of St. Benedict and was a three-time All-Conference selection in both sports. She participated the NCAA Division III Final Four in each sport, and is a two-time Hall of Fame inductee at St. Benedict. Her coaching career started as an assistant college coach at St. Benedict in 1994. In 1998, she was selected as the head coach for women’s soccer coach at the University of St. Thomas. While there, her overall record was an impressive 78-42-13, and she was twice named “MIAC Coach of the Year” for her accomplishments. I remember starting out as a youth coach and thinking what a major difference I was going to make in these young players’ lives. I was going to turn them into world-class soccer players! Then reality set in and the amount of time it took to put one practice plan together was overwhelming. I had a full time job and after a few practices, I stopped putting plans together. I just showed up hoping we would have a productive session. Needless to say, I failed my team and our season was tough. Having learned that a plan is essential to being a successful coach, I spent the next year putting together practice plans. This guide is a result of putting together practice plans for the last 18 years. This guide is intended to make your coaching job a lot easier. If you’re new to coaching, you can use this guide as your roadmap. If you’ve coached before, this guide will remove a lot of the work associated with mapping out each practice. You can supplement the practice plans with your own concepts that have worked for you in the past. 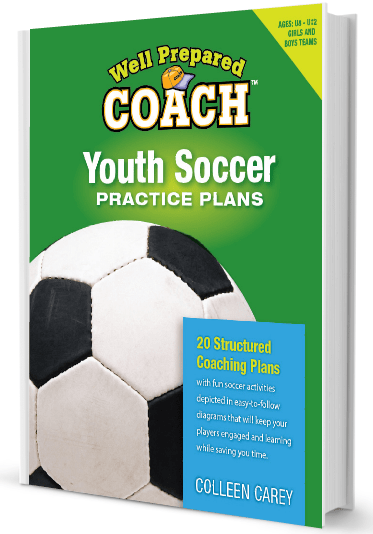 With your use of this guide, your players will be learning, having fun and picking up on the key soccer skill and tactics at the right time. As a coach, you’ll look experienced, knowledgeable and well prepared. Plus, with some of the heavy lifting removed from your schedule, you’ll have more time to appreciate the season. Enjoy! Here’s a look at a couple sample pages from the book. For the soccer activities – note the diagrams, explanations and coaching points. 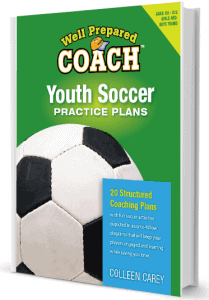 Check out this sample soccer practice plan below. Note how the diagrams make it easy for coaches to position players. Coach Carey has reviewed her stockpile of soccer drills and activities and chosen the best and most popular drills. 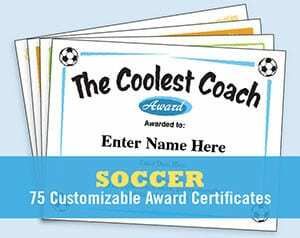 Some are coach’s favorites that really drive home important soccer knowledge and skills, while others are players’ favorites. 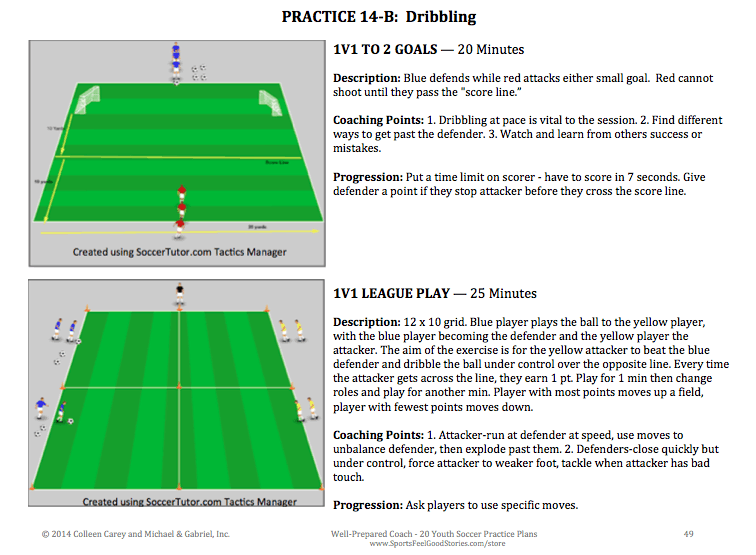 Over 90 diagrams help explain each drill and activity. Soccer coaching is a lot easier with a well thought out plan of attack. Don’t reinvent the wheel and try to start from scratch. Work with a proven system that’s sure to bolster your won/loss record, but even more importantly, develop great soccer players! It’s a time saver. Review each night’s plan for 5 minutes and you’re good to go. Coach Carey has been successfully coaching soccer from youth thru the college level. Go with her system – it works! Players get better in a hurry. In addition to each practice being planned out, each practice within the season is placed in the proper order so kids learn skills and knowledge when they need to. You’ll be able to coach in the moment. No more thinking about what the next drill should be or worrying if you’re covering the important stuff. Just follow the plans. It will save you time because you don’t have to plan. Be ready for practices in a few minutes. By not having to worry about what to do next; you can live in the moment. Enjoy the best part of coaching – working with kids and the satisfaction in seeing players improve. Players will learn a lot, and consequently, results will show up in your won/loss record. The most important thing: players will have a blast! The activities outlined are proven winners. 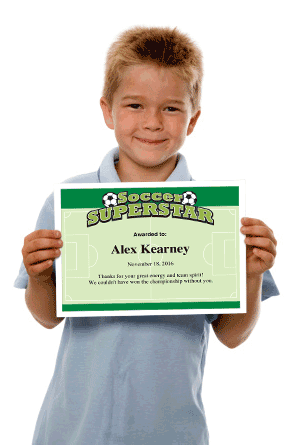 Also, check out our soccer certificates templates. Make someone happy with these stylish certificates!